My office has effectively moved to a new building on Jalan Kasablanka, South Jakarta, just few hundred meters away from Menteng Pulo where there is a special cemetery belongs to The Royal Dutch government, founded to honor Dutch soldiers and civilians killed during the occupation of Japan military force in the world war two and also the war for the independence of Indonesia. Watching the cemetery down from the 21st floor, I feel like going back to six years ago when I for the first time got a permission to enter that beautifully designed landscape that housed 4300 graves. 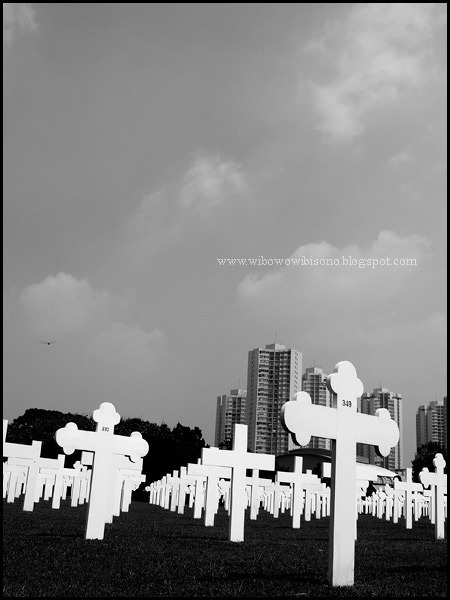 Many pictures of that cemetery I have taken. I am not sure about what I feel, but it always gives me the sense of “loss” every time I see those pictures. Is it just me or do you also feel the same about these pictures? Thank you for coming. 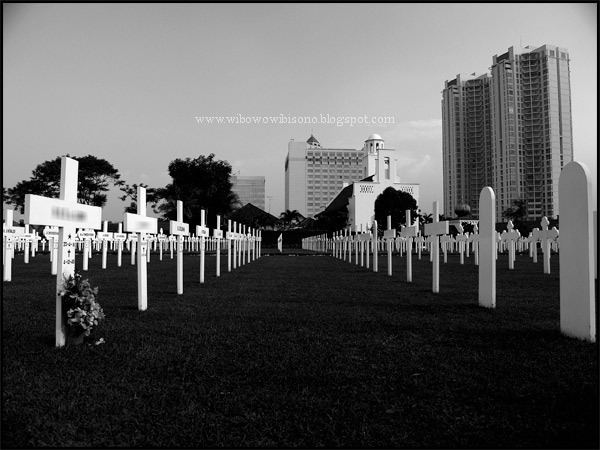 The first thing caught my eyes while entering the cemetery was a monument that I perceived as a Catholic church. 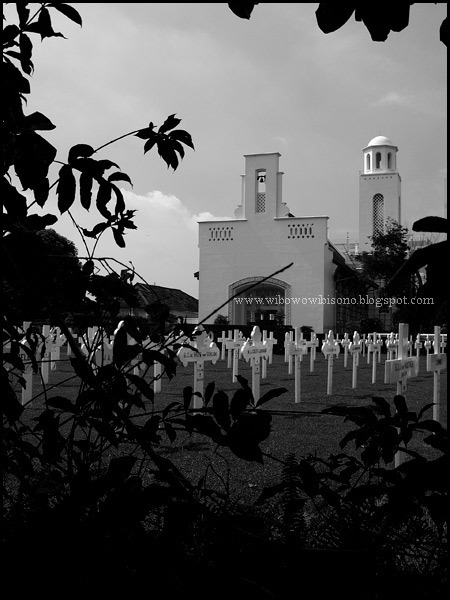 It was interesting to capture the cemetery with the monument as the background. 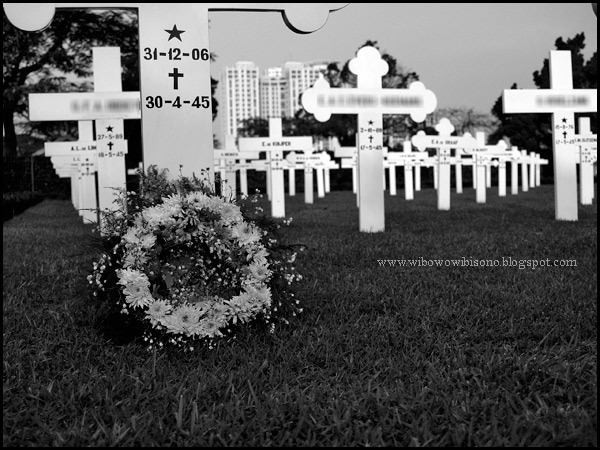 If I am not mistaken, these rows of white crosses, located not far from the main gate, marked the graves of Dutch soldiers who were killed during the Indonesian fight for independence. One tomb that attracted me most was the one belonged to General Spoor whose way of death had sparked controversies in the past. The official version said it was a heart attack that took his life. But rumor had it. A bullet triggered by his own hand had put an end to his life. Whatever caused his death, may God rest his soul. 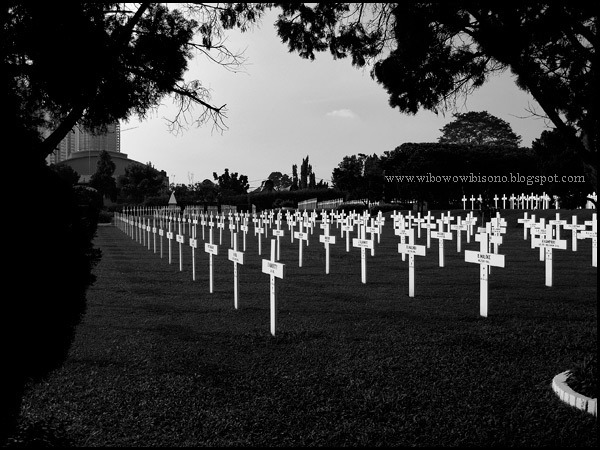 Not only were the men and soldiers who had to cope with the atrocities of the war. Women and children might as well have to bear it. 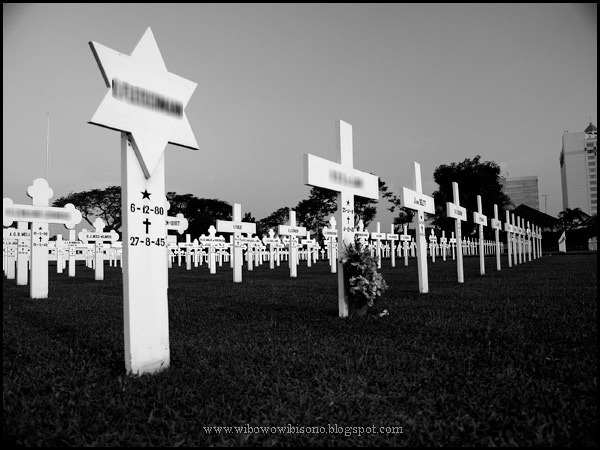 A small monument made of bronze was erected to honor the children whose graves were marked with small white crosses. 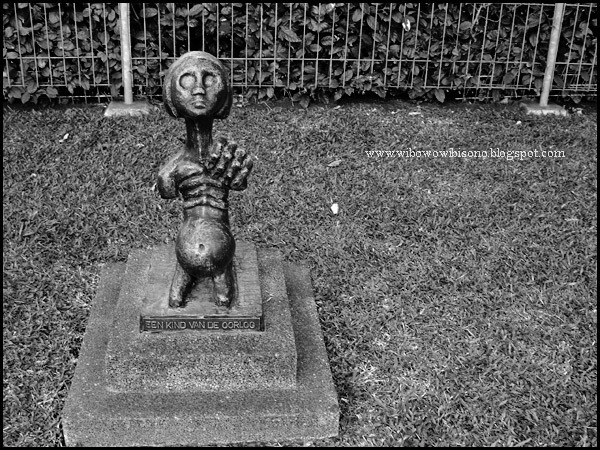 Nearly all these kids were dead in the concentration camps set by Japanese to intern the prisoners of war, due to malnutrition and other causes. 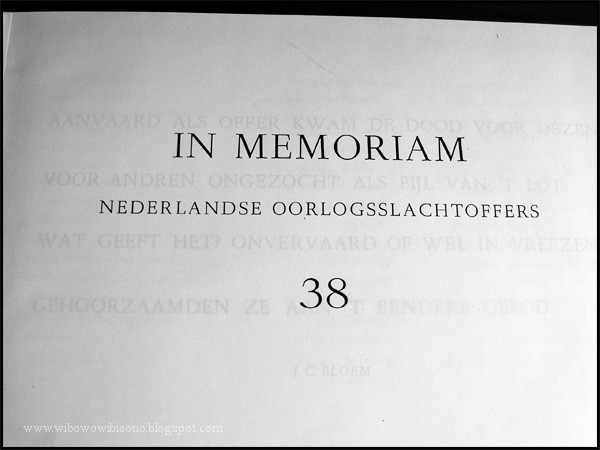 Those who were unidentified were marked "Onbekend" (Dutch term for unknown) on its tomb. What I perceived as the Catholic Church turned out to be a simultaneous church, a monument built to represent all religions embraced by all the victims buried in the cemetery. 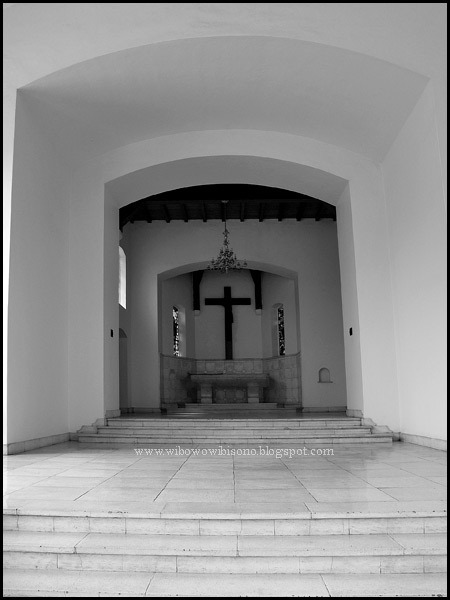 Even though it was like a church in physical, we could find other religious symbols like those of Islam, Jews and Buddha adorning its wall. The main hall was pretty much designed to be like a church where people could gather to hear a speech given from an altar. 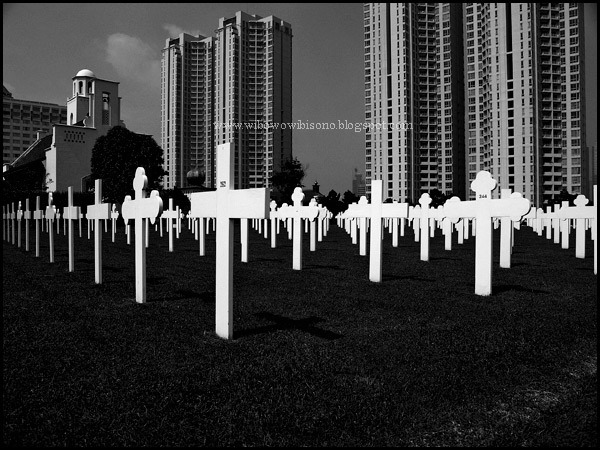 A big wooden cross was placed in front of the hall to honor the victims of British, Australian, American, and Dutch nationality. 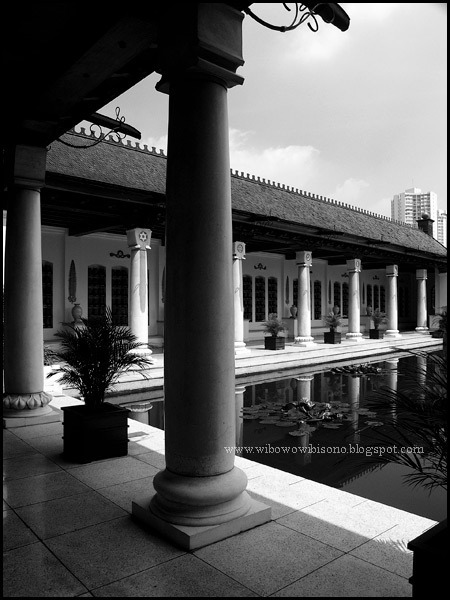 Outside the hall, there was a lotus pond encircled with semi open corridors on its two sides. 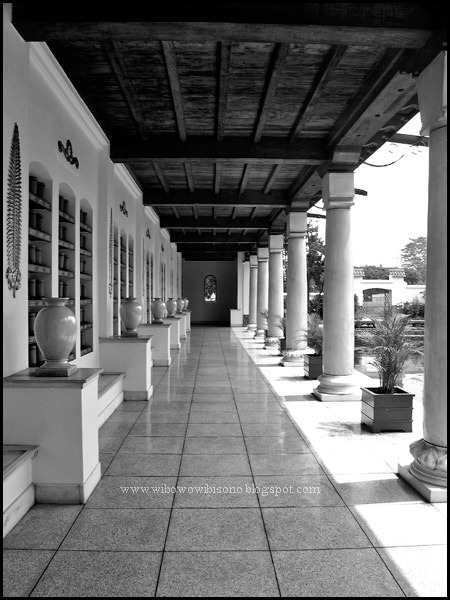 The corridors were actually the house of hundreds of urns, placed in brown jars. 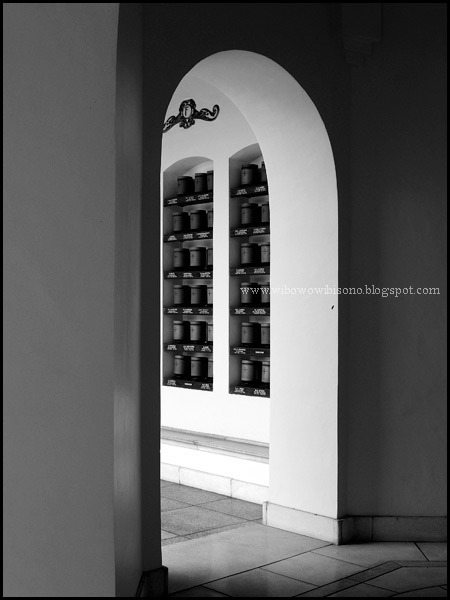 Each jar was marked with the name of the cremated person. 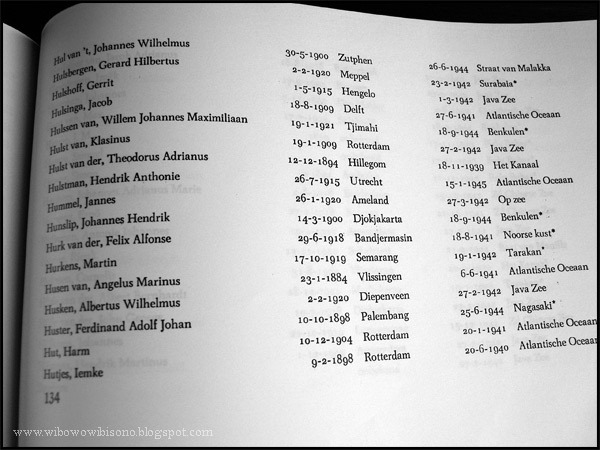 I thought that there must have been some special cause why they had been cremated, considering that it was not common for Dutch people in those days to cremate the dead. I was right. 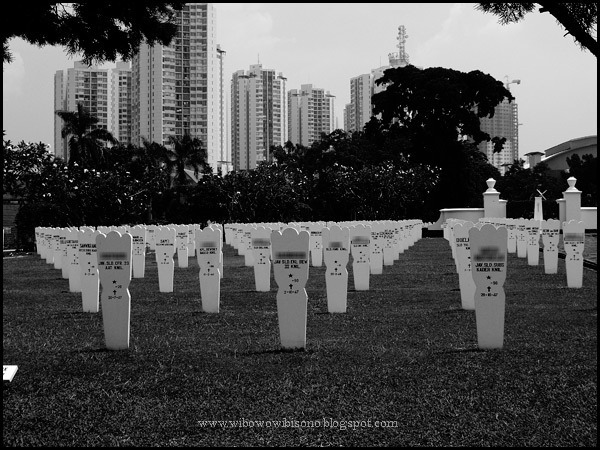 Those people being cremated were killed by the atom bomb dropped by the US on Japan. Apparently, the Japanese didn't only force the interned Dutch men to work in Sumatera and Burma, but also far in Japan. 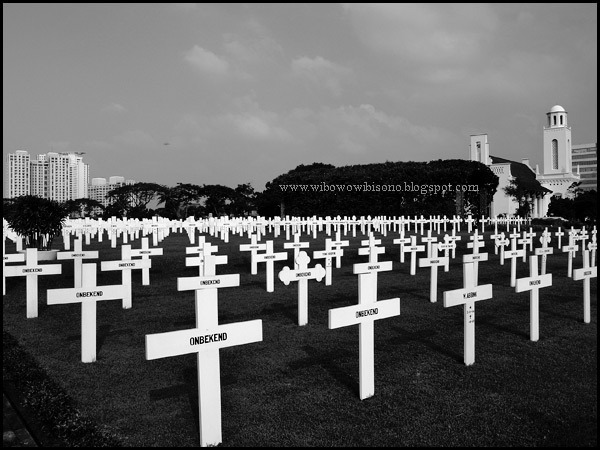 Many KNIL (Royal Dutch East Indies Army) soldiers killed in the war to defense the colony from Japanese invasion were Muslim native. 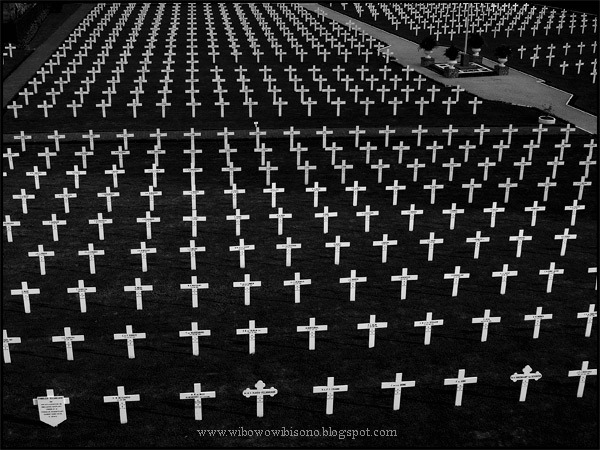 Their graves were located separately from those of Christians, Catholic, and Jews. Considering that Jews was not one of religions recognized in the Republic of Indonesia today, it was interesting to find a David - star - tomb within cross dominated cemetery. 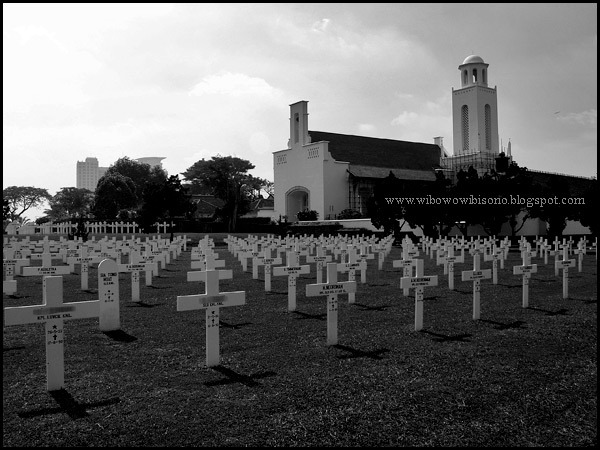 Menteng Pulo has significantly changed since the day General Spoor officially opened this cemetery in 1946. It is today besieged by sky scrapers like apartment towers, shopping centers, and office towers. 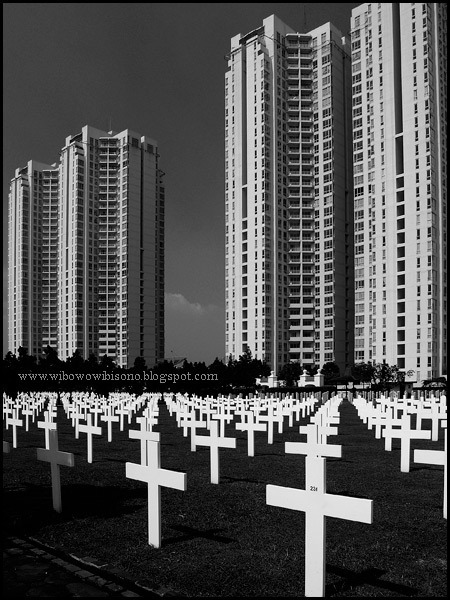 Instead of that rapid development, the cemetery remains intact, together with thousand sad stories buried down under.